Switch between stems and stripes in the Mellow Luv Tropic Bikini Bottom. Perfectly mismatched florals and stripes meet in a slimmed down bikini with a center back seam, The Tropic cut offers medium coverage and a low rise cut. Add more substance to your staple bikini with the Sweet Sands. The bikini bottom is made from a textured fabric, giving it a premium feel and a bit of structure. The Lowrider is a flattering classic cut bottom, offering fuller coverage. 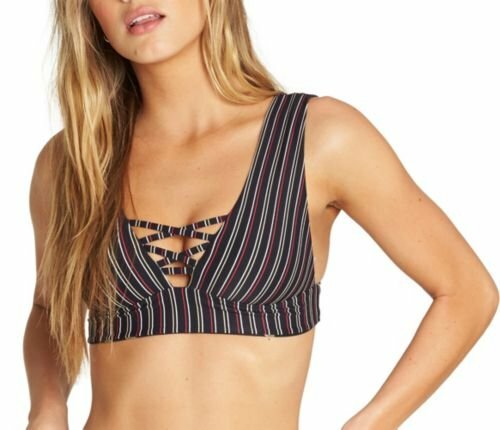 Switch between stems and stripes in the Mellow Luv Plunge Reversible Bikini Top. Perfectly mismatched florals and stripes meet in a plunge silhouette, featuring wide straps at the shoulders and ribs for support with modern lines. Add more substance to your staple one piece with the Sweet Sands. Made from a textured fabric for a premium feel and structure, the suit is finished with a modern lace-up neckline. A low scoop back turns heads and is balanced with a medium coverage cut.